This ridiculously easy recipe is one my family’s new favorites. I made it last week, and everyone raved. Chicken tenders, which can be dry and boring, are tender and delicious when used in this recipe. The secret ingredient is Big Bob Gibson’s Bar-B-Q White Sauce. Big Bob Gibson’s has been operating in Decatur, Alabama, since 1925, and its nationally recognized barbecue and sauce have garnered myriad awards over the years. The only barbecue in Birmingham that comes close to Gibson’s is Miss Myra’s in Cahaba Heights. The owner told me that he grew up (as I did) loving Gibson’s barbecue, and Miss Myra’s is his attempt to duplicate it, white sauce and all. Miss Myra’s is our number one choice for barbecue in Birmingham, and their white sauce is incredible as well. Gibson’s white sauce is so popular that it is sold online and in grocery stores nationwide. For those who are tentative about white sauce, don’t be. I am not a mayonnaise lover, but I could drink this sauce. It is tangy, peppery, vinegary, and delicious. If you like salt & vinegar chips, you’ll like the flavor of this sauce. My family and I choose white over red any day of the week. I don’t have photos for this, but it couldn’t be easier. Give it a try. I promise that some or all of your family will go crazy over it. Melt butter in 13 x 9 baking dish; remove from oven, and add tenders. Brush with a bit of extra virgin olive oil. Sprinkle with sea salt & freshly ground pepper. Turn tenders so that each side is coated with butter and oil. I keep several bottles of this sauce on hand. In addition to using on meat, it can be used in several side dishes. 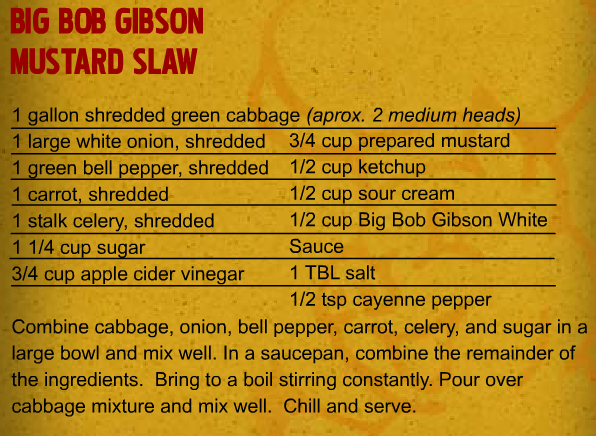 Here are two recipes using Big Bob Gibson’s white sauce that you might also try.